Looking for Competent/Qualified Persons for your mining project? What about a technical advisor, an expert witness or Owner’s or Lender’s engineer? DMT provides mining consulting for all kinds of mining projects and operations – All the mining know-how you need, from one single source! As a leading international mining consultancy, DMT offers a broad spectrum of professional technical expertise to the mining sector. Our services support mines and mining projects of all types and at all stages, from exploration right through to mine closure and recultivation. DMT provides an integrated service package of technical support and consulting for all players of the world-wide mining and metals market, including mining and exploration / development companies of all sizes, banks, credit institutions, potential investors, as well as governments, law firms, aid agencies and insurance companies. In the last 10 years alone, DMT has served over 500 public and private institutions from all over the world in mining related projects. DMT is a 700-strong team of engineers, geophysicists, technicians and consultants, operating from 30 offices in four continents. We employ highly-qualified specialists, familiar with all relevant international standards and modelling software, many of whom boast decades of international experience in the mining sector. We also engage the services of some 300 independent associates. Many of our senior professionals have Competent / Qualified Person Status and the expertise to act as Independent Lender's Engineer. Our mining consultants and engineers around the world work in close cooperation with each other and specialists from other disciplines to provide our customers with valuable local knowledge and a unique combination of extensive technical expertise. Furthermore we encourage and facilitate transfer of knowledge to build strong, capable and motivated teams and long standing working relationships with our clients. The most important message first: we have it covered! Our experience spans all types of mines, both surface and underground, and from small relatively simple operations to large, highly mechanised mines, including mines operating in extremely challenging conditions. Our mining consulting and engineering services cover all aspects of project evaluation, exploration and monitoring, resource and reserve estimation, mine support as well as mine closure and rehabilitation. DMT is renowned for its innovative and highly technical analyses. We also conceptualise and plan processes for natural resources recovery and mine development with a strong focus on increasing cost-efficiency and mine safety for our clients. Furthermore, DMT can serve as an impartial assessor. Below you can find a brief description of example projects from recent years, showcasing our competence and expertise in our main fields. This is just a small excerpt. To secure a a US$ 260 million loan for restructuring and development of the Vozkhod chromite mine in Kazakhstan, Yildirim Group selected DMT for the preparation of a geotechnical model to prove that the selected mining method and the intended dimensions of the mine layout were viable. The bank’s engineer had requested additional engineering and reporting work for the investment in the expansion of facilities and intensive mine development works, including evaluation of deformations and proof of stability of underground workings. DMT also reviewed documentation regarding geological/geotechnical parameters, mine layout and applied rock support systems. 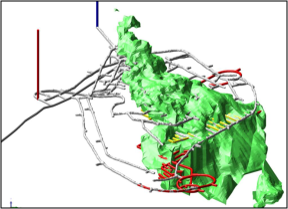 After collecting the relevant data, DMT produced a 2D Finite Element model for the mine which was judged to be of a “high standard” by the bank’s engineer. Description of the mineral resource i.e. estimated inferred/indicated, mining dilution factors, mining recovery factors etc. Evaluation of project utilities including Water/Power, infrastructure and logistics. In 2016 DMT carried out a number of analyses for K-Potash Services for their planned multi-seam potassium mining. This included determination of the relevant rock mechanical parameters for the salt rock (e.g. creep behavior) and stress analysis via large-scale numerical models for the examination of the mutual interaction with host rock. DMT also performed a stability and deformation analysis as well as the expansion design for the planned underground mine workings (main roadways, longwall, room and pillar mining system). Based on the results of our studies and our mining Expertise, we were also able to provide recommendations for the adaptation of the originally planned design. POLYAK EyÜretim Madencilik nez Enerji San. ve Tic. A.S. contracted DMT for the Exploration of the Kınık sub-bituminous coal deposit in the Soma coalfield, Turkey. DMT recommended an exploration programme according to international standards, including hydrogeological investigations, geophysical borehole measurements, methane measurements and geotechnics. Within the scope of the investigation DMT was responsible for the planning and supervision of the exploration and of the drilling campaign. Furthermore, we undertook a 2D seismic survey and produced a JORC compliant 3D deposit model to interpret the structure of the intensively faulted deposit, which enabled us to reduce both exploration period and costs. DMT was appointed to prepare a Mineral Resource estimate in accordance to NI 43-101 and prepare a Competent Persons Report for a graphite deposit. DMT oversaw and guided the exploration project, evaluated the borehole data and trench data and developed a geological model using DATAMINE. DMT liaised closely with the laboratory to ensure ISO 17025 accredited methods were being used for the analysis. Finally, DMT prepared a CPR on the project. Preparation of a Bankable Feasibility Study (TEO Study) for Construction and Operation of Inaglinsky GOK. This study was preceded by the work stage in a Scoping Study format involving preliminary decisions on viability of construction of the GOK. The Scoping Study included analysis and subsequent techno-economic assessment of different options. The second stage of elaboration with development of the Bankable Feasibility Study involved further increase in the level of detail of Inaglinsky GOK’s construction concept. The work outcomes included development of an economic model on the basis of precise calculations made for various phases and construction facilities, thus enabling determination of final costs of the project. Mineral Exploration Corporation Limited (MECL) appointed DMT for carrying out a Gravity & Magnetic survey for potash in the Bharusari block, Rajasthan, India. Within the scope of work, DMT recorded 4475 Gravity-Magnetic-DGPS stations in a 500m X 500m grid, then processed and interpreted the data. The report was successfully completed within the given timeframe. Feasibility study for the expansion of mine production and mineral processing from 10 Mt/a to 20 Mt/a at the Shougang Hierro mine. DMT's tasks included supervision of sampling for metallurgical test work, the preparation of a test work program addressing different ore types, lab and batch scale test work and pilot plant tests. DMT was also responsible for the detailed technological scheme development of this large-scale project, which took four years to complete. DMT was contracted by TTK Genel Müdürlüğü to determine the optimal location and optimal design for a high pressure water dam based on geological, geotechnical and operational conditions. The project involved a stability analysis for the designed dam for different water pressures as well as design of the temporary ground support for the dam construction stage. Our experts were also on hand to give recommendations on technical implementation during construction. DMT was contracted by SUEK for the assessment of rock burst risk according to the DMT System. With professional numerical modelling we were able to determine potential critical stress zones during development and extraction. Furthermore, numerical modelling of loosing zones caused by extraction was used to optimize the location of surface gas drainage holes. We assisted the client when dealing with authorities for measures which were not in line with the mining regulations and also gave recommendations on a mandatory control system. 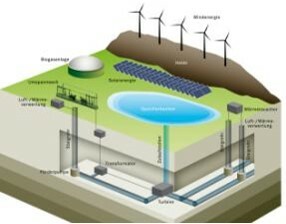 DMT was a key member of a publicly funded research project with the goal of transforming a German coal mine into a pumped storage power plant to store energy from regenerative sources. Together with University Duisburg-Essen, Ruhr University Bochum, RAG and RISP we undertook the task of developing the idea into a sound project proposal. DMT collected data and evaluated all aspects of the project, from safety during construction and operation to post-mining effects and costs. The positive feasibility study will lead to construction of a prototype. From its long history of working in the mining industry, the DMT group also offers a number of specialist services for the mining sector. These include: underground gas ventilation systems; fire prevention; rock mechanics; conveyor systems; hydrogeology and water management; component and wire rope testing as well as coke processing technology and radiation protection. Are you interested in a specific service or would like to know more? Please use the link buttons below to navigate directly to our service pages or browse the downloads at the end of the page. A full overview of our mining services can be found at the back of the Mining brochure. If you still haven't found what you're looking for, don't hesitate to get in touch. We're happy to help! Accept only the best solutions! DMT is renowned for high-quality solutions, innovative and well-engineered in terms of profitability, technology and safety. And although mining projects can be unpredictable, there's one thing you can count on in your planning: We’ll take care of it. DMT regularly attends the major mining exhibitions and also hosts a number of professional events, including the international MiningForum Conference and Exhibition, which takes place every two years and is attended by mining professionals from over 12 countries. We regularly audit and prepare mineral resource and reserve estimates and are highly experienced in reporting to international mineral resource and reserve codes and standards. MineSafe® is DMT’s own machine diagnostic system for mining equipment. This condition monitoring system measures is highly effective in the early detection of damage or defects. It can easily be integrated into existing control systems. DMT has many years of experience in providing independent technical support and advice to banks and other lenders, potential investors as well as for stock exchange listings and possible mergers. We explore, you get more! Want to know the exact size and quality of a deposit? And under what conditions can it be economically recovered? For some 150 years in the exploration of natural resources we have been investing our time, effort and expertise to answer your questions. Opencast mine planning, excavation planning, operational analyses, operational optimisation and monitoring of heavy machinery in opencast mining are our daily business. The smooth interaction of large-scale mining equipment and conveyor belt systems requires far-sighted thinking and precise detailed planning. That's exactly where DMT comes in. Safety is and always has been a focus of our work. DMT's extensive expertise in this area ensures the health and safety of your employees and safeguards your investment. DMT provides solutions for both underground and open pit mining operations and has supported the operators of some of the largest mines in the world. DMT has been connected to the German mining industry for over 250 years. Today, however the international DMT group, inlcuding former IMC group companies, operates globally, drawing on the experience and local knowledge of the whole group to best serve clients in every region. DMT supplies the necessary technical and safety know-how for the safe operation of underground conveyor systems. The compact and lightweight DMT PILOT 3D was specially developed for underground route tracking, inspection and documentation. Just one of DMT's high-precision measuring systems. Wherever in the world we are called upon to provide our services, we strive for absolute integrity and sustainable value for our customers. From coal to copper, from graphite to gold, DMT has extensive commodities experience. After more than a century in the business, our knowledge of hard coal mining is unquestionable. The DMT group, which includes the former IMC group, has a long history of working in the mining industry. Operating under the brand “DMT” since 1990, we actually have over 100 years of experience in operational mining and roots dating back over 250 years, to the foundation of the first mining safety organisation in Germany. In 1903 the first of DMT’s many expert bodies was founded. Today we benefit from decades of research and in-house technological development from a number of in-house expert bodies and testing centers, recognised by mining authorities. You, as our client, benefit from their independent assessments and advice. Through the establishment and acquisition of various international mining companies, including the former IMC group, DMT’s international expertise has grown significantly over the past 25 years in line with our portfolio. Today, as a member of TÜV NORD Group, Germany’s leading technology service provider, we are renowned for innovative solutions and individualised consulting and assistance tailored specifically to our clients’ needs. DMT also plays an active role in a significant number of reserach and development programmes. Due to the complex challenges of the ever changing commodity market, mining companies constantly strive to find more efficient technologies and processes and ultimately reduce costs. One of our primary aims is to continuously develop innovative and robust solutions for the mining sector, which is why we place great emphasis on our involvement in international innovation projects in this field. Alone in 2018, DMT is a leading partner in over 30 major R&D mining projects, from the devolopment of multi-sensor drones and an inteligent risk identification system to schemes for mineral chracterisation. Our committment to discovering pioneering ideas to strengthen the mining industry led us to initiate the first MiningForum in Germany in 1989. Now almost 30 years later, this benchmark event brings together over 350 international representatives from mining companies, service providers and authorities to address current issues and developments in the national and international natural resources sector and is a highlight in our calendar. SAVE THE DATE: 15th MiningForum 2019, 27 & 28 June, Berlin - Registration and call for papers open! DMT has offices in 10 countries, strategically placed to best serve our clients. For mining enquiries, please contact your nearest mining consultancy branch.